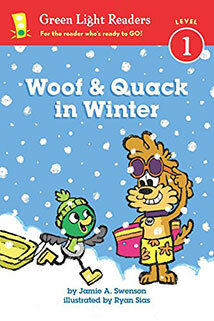 Woof & Quack in Winter: Winter is coming! Quack has decided he is absolutely not flying south this winter. He wants to play in the snow, sled, skate, and build snow ducks. His pal Woof is skeptical but goes along with the scheme until—BRRR!—Woof insists he's flying south. But wait! Dogs do not fly south in winter! Or do they? Beginning readers will be tickled to find out in this colorful, easy-to-read story starring a not-so-typical dog and duck. WOOF! WOOF! QUACK! QUACK! 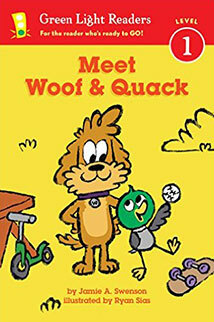 Woof and Quack are two good friends who often surprise each other (like all friends do!). When Woof doesn’t like to fetch things, Quack is surprised. When Quack does like to fetch things, Woof is surprised—and when they decide to play fetch with a lovely cake—well, the result is not all that surprising, but it is delicious (messy) fun! I hope the young readers who pick up Woof and Quack enjoy reading them, but also think about their own friendships and how it’s okay for everyone to be who they are meant to be (even if it surprises their friends!). Illustrations on this page are copyright © Ned Young.